Christianity (from the Ancient Greek: Χριστιανός Christianos and the Latin suffix -itas) is a monotheistic and Abrahamic religion based on the life and teachings of Jesus as presented in canonical gospels and other New Testament writings. It also considers the Hebrew Bible, which is known as the Old Testament, to be canonical. Adherents of the Christian faith are known as Christians. The mainstream Christian belief is that Jesus is the Son of God, fully divine and fully human and the savior of humanity. Because of this, Christians commonly refer to Jesus as Christ or Messiah. Jesus' ministry, sacrificial death, and subsequent resurrection are often referred to as the Gospel, meaning "Good News" (from the Greek: εὐαγγέλιον euangélion). In short, the Gospel is news of God the Father's eternal victory over evil, and the promise of salvation and eternal life for all people, through divine grace. Worldwide, the three largest groups of Christianity are the Roman Catholic Church, the Eastern Orthodox Church, and the various denominations of Protestantism. The Roman Catholic and Eastern Orthodox patriarchates split from one another in the East–West Schism of 1054 AD, and Protestantism came into existence during the Protestant Reformation of the 16th century, splitting from the Roman Catholic Church. Christianity began as a Jewish sect in the mid-1st century. Originating in the Levant region of the Middle East (modern Israel and Palestine), it quickly spread to Syria, Mesopotamia, Asia Minor and Egypt. It grew in size and influence over a few centuries, and by the end of the 4th century had become the official state church of the Roman Empire, replacing other forms of religion practiced under Roman rule. During the Middle Ages, most of the remainder of Europe was Christianized, with Christians also being a sometimes large religious minority in the Middle East, North Africa, Ethiopia and parts of India. Following the Age of Discovery, through missionary work and colonization, Christianity spread to the Americas, Australasia, sub-Saharan Africa, and the rest of the world. Christians believe that Jesus is the Messiah prophesied in the Hebrew Bible. The foundation of Christian theology is expressed in the early Christian ecumenical creeds which contain claims predominantly accepted by followers of the Christian faith. These professions state that Jesus suffered, died, was buried, and was resurrected from the dead in order to grant eternal life to those who believe in him and trust him for the remission of their sins (salvation). They further maintain that Jesus bodily ascended into heaven where he rules and reigns with God the Father. Most denominations teach that Jesus will return to judge all humans, living and dead, and grant eternal life to his followers. He is considered the model of a virtuous life, and both the revealer and physical incarnation of God. As of the early 21st century, Christianity has approximately 2.2 billion adherents. Christianity represents about a third of the world's population and is the world's largest religion. Christianity is the state religion of several countries. Among all Christians, 37.5% live in the Americas, 25.7% live in Europe, 22.5% live in Africa, 13.1% live in Asia, 1.2% live in Oceania and 0.9% live in the Middle East. Christianity has played a prominent role in the shaping of sub-Saharan African and Western civilization. Christ's second coming, the Day of Judgment and salvation of the faithful. The Ten Commandments, are a set of biblical principles relating to ethics and worship, which play a fundamental role in Judaism and most forms of Christianity. They include instructions to worship only God and to keep the Sabbath, and prohibitions against idolatry, blasphemy, murder, theft, and adultery. Different groups follow slightly different traditions for interpreting and numbering them. According to the synoptic gospels, Christ generalised the law into two underlying principles; The first is Hear, O Israel: The Lord our God, the Lord is one; and you shall love the Lord your God with all your heart, and with all your soul, and with all your mind, and with all your strength. While the second is You shall love your neighbor as yourself. [Matthew 22:34-40][Mark 12:28-33] These are in fact quotes from Deuteronomy 6:4 and Leviticus 19:18. Barnes' Notes on the New Testament comments on these verses saying: "These comprehend the substance of what Moses in the law, and what the prophets have spoken. What they have said has been to endeavour (sic) to win men to the love of God and each other. Love to God and man comprehends the whole [of] religion; and to produce this has been the design of Moses, the prophets, the Saviour, and the apostles." Christians believe that Jesus, as the Messiah, was anointed by God as savior of humanity, and hold that Jesus' coming was the fulfillment of messianic prophecies of the Old Testament. The Christian concept of the Messiah differs significantly from the contemporary Jewish concept. The core Christian belief is that through belief in and acceptance of the death and resurrection of Jesus, sinful humans can be reconciled to God and thereby are offered salvation and the promise of eternal life. 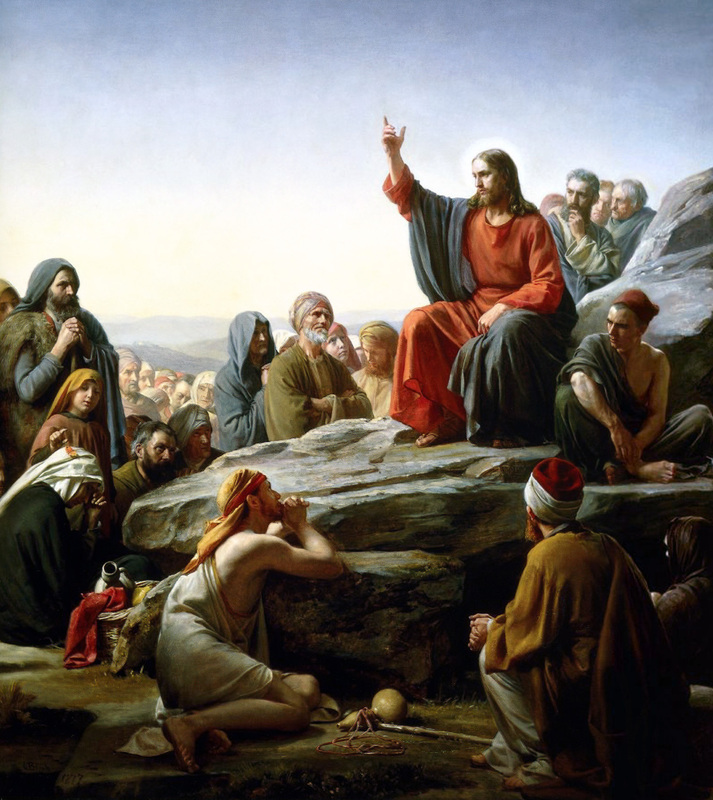 While there have been many theological disputes over the nature of Jesus over the earliest centuries of Christian history, Christians generally believe that Jesus is God incarnate and "true God and true man" (or both fully divine and fully human). Jesus, having become fully human, suffered the pains and temptations of a mortal man, but did not sin. As fully God, he rose to life again. 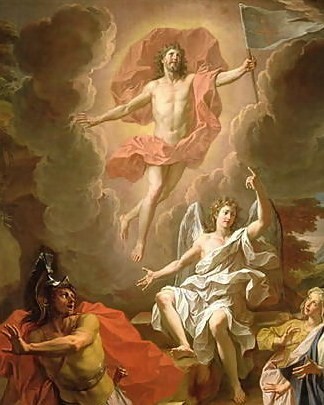 According to the Bible, "God raised him from the dead", he ascended to heaven, is "seated at the right hand of the Father" and will ultimately return[Acts 1:9–11] to fulfill the rest of Messianic prophecy such as the Resurrection of the dead, the Last Judgment and final establishment of the Kingdom of God. Christians consider the resurrection of Jesus to be the cornerstone of their faith (see 1 Corinthians 15) and the most important event in human history. Among Christian beliefs, the death and resurrection of Jesus are two core events on which much of Christian doctrine and theology is based. According to the New Testament Jesus was crucified, died a physical death, was buried within a tomb, and rose from the dead three days later.[Jn. 19:30–31] [Mk. 16:1] Template:Bibleref2c-nb The New Testament mentions several resurrection appearances of Jesus on different occasions to his twelve apostles and disciples, including "more than five hundred brethren at once",[1Cor 15:6] before Jesus' Ascension to heaven. Jesus' death and resurrection are commemorated by Christians in all worship services, with special emphasis during Holy Week which includes Good Friday and Easter Sunday. Christianity, like other religions, has adherents whose beliefs and biblical interpretations vary. Christianity regards the Biblical canon, the Old Testament and New Testament, as the inspired word of God. The traditional view of inspiration is that God worked through human authors so that, what they produced was what God wished to communicate. The Greek word referring to inspiration in 2 Timothy 3:16 is Theopneustos, which literally means "God-breathed". Some believe that divine inspiration makes our present Bibles "inerrant". Others claim inerrancy for the Bible in its original manuscripts, though none of those are extant. Still others maintain that only a particular translation is inerrant, such as the King James Version. Another view closely related is Biblical infallibility or Limited inerrancy, which affirms that the Bible is free of error as a guide to salvation, but may include errors on matters such as history, geography, or science. 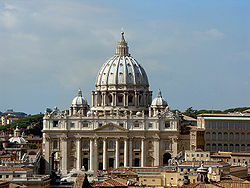 Saint Peter's Basilica, Vatican City, the largest church in the world and a symbol of the Catholic Church. Protestant Christians believe that the Bible is a self-sufficient revelation, the final authority on all Christian doctrine, and revealed all truth necessary for salvation. This concept is known as sola scriptura. Protestants characteristically believe that ordinary believers may reach an adequate understanding of Scripture because Scripture itself is clear (or "perspicuous"), because of the help of the Holy Spirit, or both. Martin Luther believed that without God's help Scripture would be "enveloped in darkness". He advocated "one definite and simple understanding of Scripture". John Calvin wrote, "all who...follow the Holy Spirit as their guide, find in the Scripture a clear light." The Second Helvetic Confession, composed by the pastor of the Reformed church in Zurich (successor to Protestant reformer Zwingli) was adopted as a declaration of doctrine by most European Reformed churches. Most Christians believe that human beings experience divine judgment and are rewarded either with eternal life or eternal damnation. This includes the general judgment at the Resurrection of the dead as well as the belief (held by Roman Catholics, Orthodox and most Protestants) in a judgment particular to the individual soul upon physical death. Some Christian groups, including Anglicans, Lutherans and Seventh-day Adventists hold to mortalism, the belief that the human soul is not naturally immortal, and is unconscious during the intermediate state between bodily death and resurrection. These Christians also hold to Annihilationism, the belief that subsequent to the final judgment, the wicked will cease to exist rather than suffer everlasting torment. Jehovah's Witnesses hold to a similar view. Some groups depart from this traditional liturgical structure. A division is often made between "High" church services, characterized by greater solemnity and ritual, and "Low" services, but even within these two categories there is great diversity in forms of worship. Seventh-day Adventists meet on Saturday, while others do not meet on a weekly basis. Charismatic or Pentecostal congregations may spontaneously feel led by the Holy Spirit to action rather than follow a formal order of service, including spontaneous prayer. Quakers sit quietly until moved by the Holy Spirit to speak. Some Evangelical services resemble concerts with rock and pop music, dancing, and use of multimedia. For groups which do not recognize a priesthood distinct from ordinary believers the services are generally led by a minister, preacher, or pastor. Still others may lack any formal leaders, either in principle or by local necessity. Some churches use only a cappella music, either on principle (for example, many Churches of Christ object to the use of instruments in worship) or by tradition (as in Orthodoxy). Baptism is the ritual act, with the use of water, by which a person is admitted to membership of the Church. Beliefs on baptism vary among denominations. Differences occur firstly, on whether the act has any spiritual significance, some churches hold to the doctrine of Baptismal Regeneration, which affirms that baptism creates or strengthens a person’s faith, and is intimately linked to salvation, this view is held by Catholic and Eastern Orthodox churches as well as Lutherans and Anglicans, while others simply acknowledge it as a purely symbolic act, an external public declaration of the inward change which has taken place in the person. Secondly, there are differences of opinion on the methodology of the act. These methods being: Baptism by Immersion; if immersion is total, Baptism by Submersion; and Baptism by Affusion (pouring) and Baptism by Aspersion (sprinkling). Those who hold the first view may also adhere to the tradition of Infant Baptism. Intercessory prayer is prayer offered for the benefit of other people. There are many intercessory prayers recorded in the Bible, including prayers of the Apostle Peter on behalf of sick persons[Acts 9:40] and by prophets of the Old Testament in favor of other people. [1Ki 17:19–22] In the New Testament book of James no distinction is made between the intercessory prayer offered by ordinary believers and the prominent Old Testament prophet Elijah. [Jam 5:16–18] The effectiveness of prayer in Christianity derives from the power of God rather than the status of the one praying. The Middle Ages brought about major changes within the church. Pope Gregory the Great dramatically reformed ecclesiastical structure and administration. In the early 8th century, iconoclasm became a divisive issue, when it was sponsored by the Byzantine emperors. 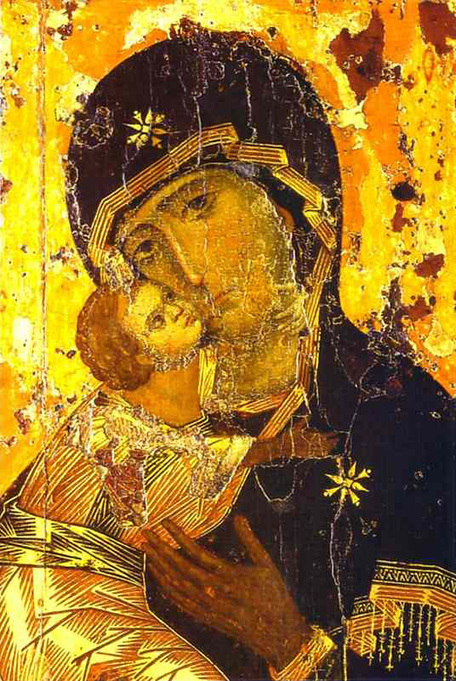 The Second Ecumenical Council of Nicaea (787) finally pronounced in favor of icons. In the early 10th century, Western Christian monasticism was further rejuvenated through the leadership of the great Benedictine monastery of Cluny. A simplified chart of historical developments of major groups within Christianity. However, one should note that Christianity was never a unified movement. There were many diverse Christian communities with wildly different Christologies, eschatologies, soteriologies, and cosmologies that existed alongside the "Early Church" which is itself a projected concept to indicate which communities were "proto-orthodox", in that their views would become dominate. In many ways, the first three centuries of Christianity was significantly more diverse than modern Christianity. Template:Denominations of Christianity The Catholic Church comprises those particular churches, headed by bishops, in communion with the Pope, the Bishop of Rome, as its highest authority in matters of faith, morality and Church governance. Like the Eastern Orthodox, the Roman Catholic Church through Apostolic succession traces its origins to the Christian community founded by Jesus Christ. Catholics maintain that the "one, holy, catholic and apostolic church" founded by Jesus subsists fully in the Roman Catholic Church, but also acknowledges other Christian churches and communities and works towards reconciliation among all Christians. The Catholic faith is detailed in the Catechism of the Catholic Church. The oldest Protestant groups separated from the Catholic Church in the 16th century Protestant Reformation, followed in many cases by further divisions. For example, the Methodist Church grew out of Anglican minister John Wesley's evangelical and revival movement in the Anglican Church. Several Pentecostal and non-denominational Churches, which emphasize the cleansing power of the Holy Spirit, in turn grew out of the Methodist Church. Because Methodists, Pentecostals, and other evangelicals stress "accepting Jesus as your personal Lord and Savior", which comes from John Wesley's emphasis of the New Birth, they often refer to themselves as being born-again. Some of the churches originating during this period are historically connected to early-19th century camp meetings in the Midwest and Upstate New York. American Millennialism and Adventism, which arose from Evangelical Protestantism, influenced the Jehovah's Witnesses movement (with 7 million members), and, as a reaction specifically to William Miller, the Seventh-day Adventists. Others, including the Christian Church (Disciples of Christ), Evangelical Christian Church in Canada, Churches of Christ, and the Christian churches and churches of Christ, have their roots in the contemporaneous Stone-Campbell Restoration Movement, which was centered in Kentucky and Tennessee. Other groups originating in this time period include the Christadelphians and The Church of Jesus Christ of Latter-day Saints, the largest denomination of the Latter Day Saint movement with over 14 million members. While the churches originating in the Second Great Awakening have some superficial similarities, their doctrine and practices vary significantly. Cultural Christian is a broad term for people with either ethnic or religious Christian heritage who may not believe in the religious claims of Christianity, but who retain an affinity for the culture, art, music, and so on related to it. Western culture, throughout most of its history, has been nearly equivalent to Christian culture. Though Western culture contained several polytheistic religions during its early years under the Greek and Roman empires, as the centralized Roman power waned, the dominance of the Catholic Church was the only consistent force in Europe. Until the Age of Enlightenment, Christian culture was the predominant force in western civilization, guiding the course of philosophy, art, and science. Criticism of Christianity and Christians goes back to the Apostolic age, with the New Testament recording friction between the followers of Jesus and the Pharisees and scribes (e.g. Mark 7:1-23 and Matthew 15:1-20). In the second century Christianity was criticized by the Jews on various grounds, e.g. that the prophecies of the Hebrew Bible could not have been fulfilled by Jesus, given that he did not have a successful life. By the third century criticism of Christianity had mounted, partly as a defense against it, and the 15 volume Adversus Christianos by Porphyry was written as a comprehensive attack on Christianity, in part building on the pre-Christian concepts of Plotinus. ^ a b c The term "Christian" (Greek Χριστιανός) was first used in reference to Jesus' disciples in the city of Antioch[Acts 11:26] about 44 AD, meaning "followers of Christ". The name was given by the non-Jewish inhabitants of Antioch, probably in derision, to the disciples of Jesus. In the New Testament the names by which the disciples were known among themselves were "brethren", "the faithful", "elect", "saints", "believers". The earliest recorded use of the term "Christianity" (Greek Χριστιανισμός) was by Ignatius of Antioch, around 100 AD. See Elwell/Comfort. Tyndale Bible Dictionary, pp. 266, 828. ^ "Religion: Christianity". bbc.co.uk. 2012-08-13. http://www.bbc.co.uk/religion/religions/christianity. Retrieved 2012-08-13. ^ Epistle to the Romans 6:23: "For the wages of sin is death, but the free gift of God is eternal life in Christ Jesus our Lord." ^ S. T. Kimbrough, ed (2005). Orthodox and Wesleyan Scriptural understanding and practice. St Vladimir's Seminary Press. ISBN 978-0-88141-301-4. http://books.google.com/books?id=q-vhwjamOioC&pg=PA23&dq=anagignoskomena#v=onepage&q=anagignoskomena&f=true. ^ Muslim-Christian Relations. Amsterdam University Press. 2006. ISBN 978-90-5356-938-2. http://books.google.com/books?id=g2AtOlJMPTUC&pg=PA52. Retrieved 2007–10–18. "The enthusiasm for evangelization among the Christians was also accompanied by the awareness that the most immediate problem to solve was how to serve the huge number of new converts. Simatupang said, if the number of the Christians were double or triple, then the number of the ministers should also be doubled or tripled and the tole of the laity should be maximized and Christian service to society through schools, universities, hospitals and orphanages, should be increased. In addition, for him the Christian mission should be involved in the struggle for justice amid the process of modernization." ^ Fred Kammer (2004-05-01). Doing Faith Justice. Paulist Press. ISBN 978-0-8091-4227-9. http://books.google.com/?id=WmuV6g0yR3sC&pg=PA77&dq=christianity+serve+others+hospitals+orphanages+schools#v=onepage&q&f=false. Retrieved 2007–10–18. "Theologians, bishops, and preachers urged the Christian community to be as compassionate as their God was, reiterating that creation was for all of humanity. They also accepted and developed the identification of Christ with the poor and the requisite Christian duty to the poor. Religious congregations and individual charismatic leaders promoted the development of a number of helping institutions-hospitals, hospices for pilgrims, orphanages, shelters for unwed mothers-that laid the foundation for the modern "large network of hospitals, orphanages and schools, to serve the poor and society at large."" ^ Christian Church Women: Shapers of a Movement. Chalice Press. 1994-03. ISBN 978-0-8272-0463-8. http://books.google.com/books?id=dz_EM2ofIb4C&pg=PA132. Retrieved 2007–10–18. "In the central provinces of India they established schools, orphanages, hospitals, and churches, and spread the gospel message in zenanas." ^ Sheed, Frank. Theology and Sanity. (Ignatius Press: San Francisco, 1993), pp. 276. ^ "Christianity". Knowledge Resources. Berkley Center for Religion, Peace, and World Affairs. http://berkleycenter.georgetown.edu/resources/traditions/christianity. Retrieved 2011-11-22. ^ a b c ANALYSIS December 19, 2011 (2011-12-19). "Global Christianity". Pewforum.org. http://www.pewforum.org/Christian/Global-Christianity-exec.aspx. Retrieved 2012-08-17. ^ Zoll, Rachel (December 19, 2011). "Study: Christian population shifts from Europe". Associated Press. http://www.guardian.co.uk/world/feedarticle/10003271. Retrieved 25 February 2012. ^ a b c Cambridge University Historical Series, An Essay on Western Civilization in Its Economic Aspects , p.40: Hebraism, like Hellenism, has been an all-important factor in the development of Western Civilization; Judaism, as the precursor of Christianity, has indirectly had had much to do with shaping the ideals and morality of western nations since the christian era. ^ a b c d Caltron J.H Hayas, Christianity and Western Civilization (1953),Stanford University Press, p.2: That certain distinctive features of our Western civilization — the civilization of western Europe and of America— have been shaped chiefly by Judaeo - Graeco - Christianity, Catholic and Protestant. ^ a b Horst Hutter‏, University of New York, Shaping the Future: Nietzsche's New Regime of the Soul And Its Ascetic Practices (2004), p.111:three mighty founders of Western culture, namely Socrates, Jesus, and Plato. ^ a b Fred Reinhard Dallmayr‏, Dialogue Among Civilizations: Some Exemplary Voices (2004), p.22: Western civilization is also sometimes described as "Christian" or "Judaeo- Christian" civilization. ^ Peter Theodore Farrington (February 2006). "The Oriental Orthodox Rejection of Chalcedon" (113). ^ Barnes, Albert. Barnes' New Testament Notes, Entry for Matthew 22:40. http://www.ccel.org/ccel/barnes/ntnotes.iv.xxii.xl.html. Retrieved 7 October 2012. ^ a b Eisenbaum, Pamela (Winter 2004). "A Remedy for Having Been Born of Woman: Jesus, Gentiles, and Genealogy in Romans". Journal of Biblical Literature 123 (4): 671–702. DOI:10.2307/3268465. Retrieved on 2009-04-03. ^ "Grace and Justification". Catechism of the Catholic Church. Archived from the original on 15 August 2010. http://web.archive.org/web/20100815001751/http://www.vatican.va/archive/catechism/p3s1c3a2.htm. ^ Virkler, Henry A. (2007). Ayayo, Karelynne Gerber. ed. Hermeneutics: Principles and Processes of Biblical Interpretation (2nd ed.). Grand Rapids, USA: Baker Academic. p. 21. ISBN 978-0-8010-3138-0. ^ Mathison. The Shape of Sola Scriptura. ^ Elwell, Walter A. (1984). Evangelical Dictionary of Theology. Grand Rapids, Mich.: Baker Book House. ISBN 0-8010-3413-2. ^ "The death that Adam brought into the world is spiritual as well as physical, and only those who gain entrance into the Kingdom of God will exist eternally. However, this division will not occur until Armageddon, when all people will be resurrected and given a chance to gain eternal life. In the meantime, "the dead are conscious of nothing." What is God's Purpose for the Earth?" Official Site of Jehovah's Witnesses. Watchtower, July 15, 2002. ^ "The World Factbook: Armenia". CIA. https://www.cia.gov/library/publications/the-world-factbook/geos/am.html. Retrieved 8 October 2011. ^ a b Orlandis, A Short History of the Catholic Church (1993), preface. ^ Mullin, 2008, p. 93-4. ^ Novak, Michael (1988). Catholic social thought and liberal institutions: Freedom with justice. Transaction. p. 63. ISBN 978-0-88738-763-0. http://books.google.com/books?id=7pb1GDmxA1UC&pg=PA63. ^ "Religion may become extinct in nine nations, study says". BBC News. 2011-03-22. http://www.bbc.co.uk/news/science-environment-12811197. ^ "図録▽世界各国の宗教". .ttcn.ne.jp. http://www2.ttcn.ne.jp/~honkawa/9460.html. Retrieved 2012-08-17. ^ Encyclopædia Britannica table of religions, by region. Retrieved November 2007. ^ ANALYSIS December 19, 2011 (2011-12-19). "Europe". Pewforum.org. http://www.pewforum.org/Christian/Global-Christianity-europe.aspx. Retrieved 2012-08-17. ^ ANALYSIS December 19, 2011 (2011-12-19). "Americas". Pewforum.org. http://www.pewforum.org/Christian/Global-Christianity-americas.aspx. Retrieved 2012-08-17. ^ Gary Lane. "House Churches Growing in Iran". Cbn.com. http://www.cbn.com/CBNnews/437006.aspx. Retrieved 2012-08-17. ^ View more articles by Jeni Mitchell. "FREEradicals - Targeting Christians in Central Asia". Icsr.info. http://icsr.info/blog-item.php?id=111. Retrieved 2012-08-17. ^ "Despite Government Set-backs, Christianity Is Alive in Central Asia". Opendoorsusa.org. 2011-11-30. http://www.opendoorsusa.org/pray/prayer-updates/2011/December/Christianity-Is-Alive-in-Central-Asia. Retrieved 2012-08-17. ^ "Christianity, non-religious register biggest growth: Census 2010". Newnation.sg. 2011-01-13. http://newnation.sg/2011/01/christianity-non-religious-register-biggest-growth-census-2010/. Retrieved 2012-08-17. ^ "In Indonesia, Lunar New Year an old practice for young Christians". Webcitation.org. http://www.webcitation.org/60y2wqSF7. Retrieved 2012-08-17. ^ "In Indonesia, the Chinese go to church". Nytimes.com. 2006-04-27. http://www.nytimes.com/2006/04/27/opinion/27iht-edbrazier.html?_r=1. Retrieved 2012-08-17. ^ "Christianity 2010: a view from the new Atlas of Global Christianity". Goliath.ecnext.com. 2010-01-01. http://goliath.ecnext.com/coms2/gi_0199-12060445/Christianity-2010-a-vie-from.html. Retrieved 2012-08-17. ^ "Christianity on upswing in Japan". Wnd.com. 2006-03-18. http://www.wnd.com/2006/03/35319/. Retrieved 2012-08-17. ^ Landau, Christopher (2009-10-26). "Will South Korea become Christian?". BBC News. http://news.bbc.co.uk/2/hi/8322072.stm. Retrieved 2012-08-17. ^ Sydney E. Ahlstrom (, p. 381.) characterized denominationalism in America as "a virtual ecclesiology" that "first of all repudiates the insistences of the Roman Catholic church, the churches of the 'magisterial' Reformation, and of most sects that they alone are the true Church." For specific citations, on the Roman Catholic Church see the Catechism of the Catholic Church §816; other examples: Donald Nash, Why the Churches of Christ are not a Denomination; Wendell Winkler, Christ's Church is not a Denomination; and David E. Pratt, What does God think about many Christian denominations? ^ Ehrman, Bart D. (2003). Lost Christianities: The Battles for Scripture and the Faiths We Never Knew. Oxford University Press, USA. p. 1. ISBN 0-19-514183-0. ^ "About The Methodist Church". Methodist Central Hall Westminster. http://www.methodist-central-hall.org.uk/history/WhatisMethodism.htm. Retrieved 2007-12-31. ^ "Protestantism - Definition of Protestantism". Christianity.about.com. 2012-06-19. http://christianity.about.com/od/glossary/qt/Protestantism.htm. Retrieved 2012-08-17. ^ "Facts and Statistics". The Church of Jesus Christ of Latter-day Saints. http://www.mormonnewsroom.org/facts-and-statistics/. Retrieved 14 June 2012. The Church counts all members who were ever baptized, who have neither been excommunicated nor asked to have their names removed from church records. Independent surveys estimate that about 50% of people on LDS Church rolls do not identify with the religion. See John Dart, Counting Mormons: study says LDS numbers inflated, Christian Century, August 21, 2007. ^ a b Koch, Carl (1994). 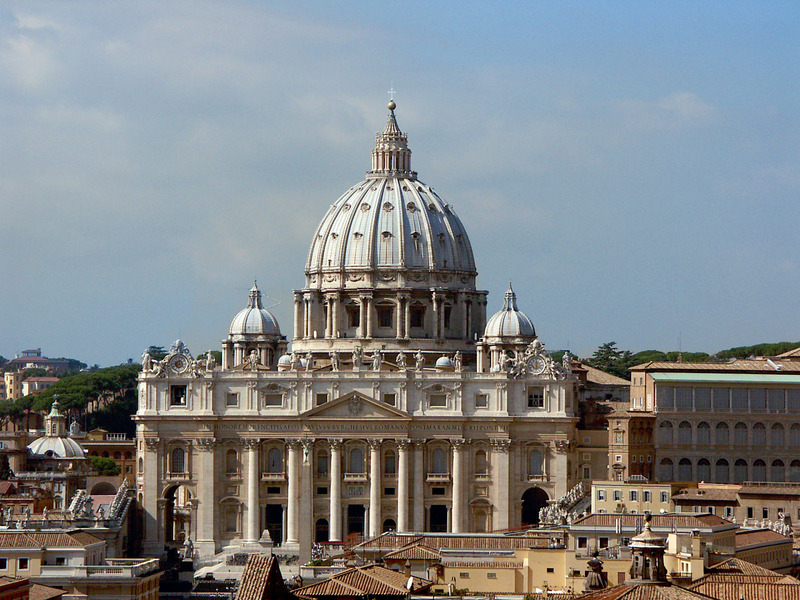 The Catholic Church: Journey, Wisdom, and Mission. Early Middle Ages: St. Mary's Press. ISBN 9780884892984. ^ Koch, Carl (1994). The Catholic Church: Journey, Wisdom, and Mission. The Age of Enlightenment: St. Mary's Press. ISBN 9780884892984. ^ Dawson, Christopher; Glenn Olsen (1961). Crisis in Western Education (reprint ed.). ISBN 9780813216836. ^ Christianity: An Introduction by Alister E. McGrath 2006 ISBN 1405108991 pp. 125-126.
editors, Sinclair B. Ferguson, David F. Wright ; consulting editor, J.I. Packer. (1988). Ferguson, Sinclair; Wright, David. eds. New Dictionary of Theology. consulting ed. Packer, James. Leicester: Inter-Varsity Press. ISBN 0-85110-636-6. White, Howard A. The History of the Church. This page uses content from the English language Wikipedia. The original content was at Christianity. The list of authors can be seen in the page history. As with this Familypedia wiki, the content of Wikipedia is available under the Creative Commons License.